I couldn’t live a day without using a perfumed lotion after shower. I know this is a little sign of vanity because the healthiest body lotions are fragrance free, but I just get bored of an unscented body lotion in a second. Today I will try to make you familiar with some of the body lotions I like so you will know later to compare scented body lotions and pick the one right for you. If you prefer delicate scented body lotions and cannot stand greasy body lotions – let alone body butter – I recommend trying Verbena Harvest Body Lotion bt L’Occitane. The lotion is easily absorbed by skin and smells like fresh cut lemons. Another nicely feminine scented body lotion with a lightweight texture is Cabotine Body Lotion by Gres. Ginseng is not good only for your health, but can also perform magic when it comes to applying it on the skin. What am I talking about? Invigorating Suma Ginseng Body Lotion by Molton Brown contains a mix of essential oils and Brazilian ginseng to help stimulate body circulation. I recommend using it in cold days or if you suffer from cold feet. What do you think of lavender and marshmellow ‘trapped’ in a body lotion bottle? I know it is a strange combination, but I bet that the moment you will sniff the first time Lavender Body Care Lotion by Jurlique it will remind you of happy childhood moments. Recommended for all skin types. Another citrusy body lotion is Fresh’s product - Hesperides Body Lotion – a mix of grapefruit and lemon extracts. Its formula is enriched with shea butter for an instant hydration. I love smooth skin and Le Bain Body Lotion by Joop does what it promises – deeply hydrate skin without leaving a greasy film. I recommend it for using it before going to a party because your dress (or outfit) won’t get stained. Happiness Mango Essential Massage Lotion sounds too delicious to pass it over. I couldn’t resist temptation of sniffing it and testing it home. Sircuit Skin Cosmeceuticals has done a great job in capturing essential oils and other nourishing ingredients. The result is an emollient massage lotion. Bedtime body rituals often include applying a moisturizing body lotion. Chaumet Body Lotion is suitable for allergy prone skin, gently hydrating it. Spring is in the air. 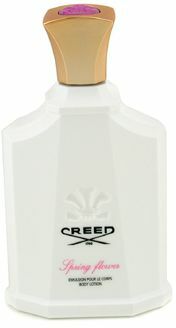 Pamper yourself with Creed’s Spring Flower Body Lotion, a floral scented body moisturizer. Suitable for all skin types. Skin needs constant care and women over 40 years old should consider using special care products suitable for their age. Body Activ Renovateur Renewing Body Lotion by Lierac contains AHA and exfoliating micro particles to stimulate cell regeneration. Is there really anything as rewarding as a nice warm bubble bath? We cover all of the aspects of bath, body, and mind to ensure that you are taken care of, before and after the bath!